If you’ve been in the online world for more than 5 minutes, you’ll know that the term ‘ideal client’ is used multiple times a day. Maybe that’s something you’re cool with. Maybe that’s something which annoys you. Whichever way you see it, it’s something which just IS when it comes to online business. I’ve personally been doing some re-thinking recently on my ideal client after having a summer where I felt a little disconnected and uncertain on what the future would look like for my business. Side bar real quick here – When I was a high school teacher, I could go to work and do my job even on my worst days. I guess I CAN do that here in my business too, but the truth is, I don’t want to. This is my soul’s calling, my very reason for being here and the work which gives me purpose, vision and mission with such clarity. 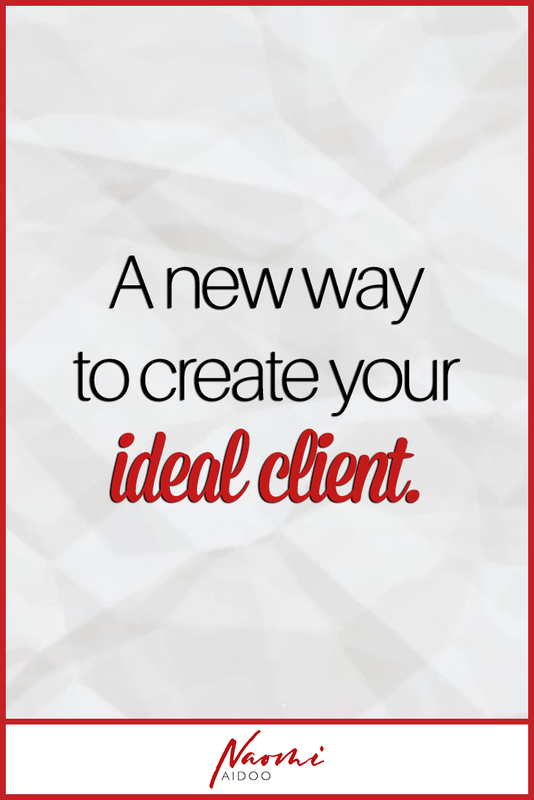 So for me, having an ideal client is important. The more niche, the better. If I can MASSIVELY impact one as opposed to vaguely impact 10, I’m going for the one. Thankfully, my business has afforded me the opportunity to impact a number of women from all over the globe. So whenever things feel a bit ‘off’, I usually realise pretty quickly that it has something to do with not talking to the person who I am INSPIRED and CALLED to talk to every day. When thinking through my ideal client version 10.0 or wherever I’m at right now, I started thinking through a list. Use this list yourself when you’re working through the type of person you would IDEALLY love to be working with. 1. Where are they in their business right now? 2. How old are they and what’s their marital/family situation? 3. What’s their approximate income? 4. How much time do they give to their business per week? 5. What’s their career background? There are a few other questions I ask myself when re-imagining this woman. But those are the main ones. Recently when going through this exercise, I had a revelation. You see, my ideal client may well be a total newbie in business, they may also have been in business longer than I have. My ideal client might be 19, single and eager to start in business fresh out of college. They might also be 50 with 3 kids and a full-time job. My ideal client might have a six-figure salary. They might also be barely scraping by on minimum wage. My ideal client might have just 2 hours a week to give to their business total. They might also have 20 hours a week. My ideal client might have been climbing the corporate ladder for a decade before coming to work with me. They may also have never had a regular job in their life. If they’re new in business, they’re a quick learner, mission focused and ready to not only learn but to DO. If they’ve been in business longer than me, they’re realising that they’re receiving coaching for a reason and are ready to be teachable and flexible in order to see the results they’ve been waiting for. If they’re 19 and fresh out of college, they’re realising that all of this time that they’ve got can be put to good use and doesn’t have to be wasted in front of hours of Netflix. If they’re a working mother, they’re committed to doing this for THEM no matter what. If they’re already wealthy, I’m already convinced that they’re doing this for impact more than they are income which, in a lot of ways, makes my job a lot easier. If they’re pay check to pay check and not even that, I’m impressed that they’re SO committed to their calling that they’re finding a way to get the money for the support even if they don’t have it disposably available to them. If they’ve got 2 hours per week to give to their business, we’re talking through how to MAXIMISE those two hours in order to create the most impact. We’re not seeing the time as ‘barely anything’, we’re making the most of it every single week. If they’re got 20 hours, we’re talking through how to be productive and not simply busy so that they ACTUALLY work, rather than just think they do. And if they’ve been in corporate forever and have finally stepped down, I’m excited to hear of how their passion led them to leave what was lucrative to seek what t they’re truly here for. And if they’ve never worked a day in their life, I’m teaching them about work ethic, routine, structure and systems so that that all starts now. You see, when push comes to shove, my ideal client isn’t at any particular ‘life stage’ as such. They’re in a particular head space. My ideal client is in a head space which says that they are NOT a victim to their circumstances past or present. They’re no longer available for the excuses which allow them to keep putting their life’s work off until ‘tomorrow’. They’re not saying that ‘they’d love to but…’ For them, there is no but. They’d love to and so they will. They’re not seeing problems, they’re seeing puzzle pieces to be put back together. And they’re not stopping until they see what God has called them to truly come to fruition. That kind of mindset doesn’t belong to a certain type of life stage, but it does belong to a certain type of person. That’s my person and if it’s you, please know that I’m rooting for you, praying for you and I’m speaking to you every single time. I want to empower you, to call you out, to remind you of who you are and to remind you that the world is waiting for your work. Because it really and truly is and I can’t wait to see it. If it sounds like I’m describing you to a tee but now you’re kicking yourself because you missed out on jumping into Biblical Business Academy, don’t panic! You can get back on the waitlist! BUT… I’ve just opened up all of my courses with a 50% flash sale off of ALL of them!! And so if working on your business at your own pace is your jam, one of these seven courses is for you. Click the button below to explore the library.